So wrote a quiet young Ohioan in 1900, one in an ancient line of men who had wanted to fly -- wanted it passionately, fecklessly, hopelessly. But at the turn of the twentieth century, Wilbur Wright and a scattered handful of other adventurers conceived a conviction that the dream lay at last within reach, and in a headlong race across ten years and two continents, they competed to conquer the air. James Tobin, winner of the National Book Critics Circle Award in biography, has at last given this inspiring story its definitive telling. For years Wright and his younger brother, Orville, experimented in utter obscurity. Meanwhile, the world watched as the imperious Samuel Langley, armed with a rich contract from the U.S. War Department and all the resources of the Smithsonian Institution, sought to create the first manned flying machine. While Langley became obsessed with flight as a problem of power, the Wrights grappled with it as a problem of balance. Thus their machines took two very different paths -- one toward oblivion, the other toward the heavens. To Conquer the Air is a hero's tale of overcoming obstacles within and without. It is the story of mankind's most wondrous technological achievement; and it is an account of the mystery of creativity and character. Years later, Orville Wright would remark to Charles Lindbergh: 'No one quite understands the spirit and conditions of those times.' In the centennial year of human flight, To Conquer the Air is itself a heroic achievement. 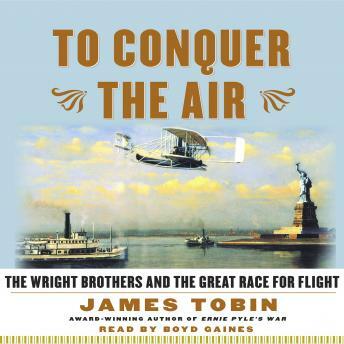 Best book on the Wright Bros---and their competitors---I've yet heard. Includes amazing quotes, history, personal stories, and engineering. I highly recommend this book! I haven't quite finished this one yet, but it has been excellent so far! Through the years, I've had an appetite for reading about the Wright brothers that has never quite been satisfied. Literally hundreds of books have been written about the two & I suppose I've worked my way through a dozen or more before finding James Tobin's version. This book provides a nuanced history of the search for answers in unlocking the misteries of flight in America as the 19th century closed and the 20th opened. Actor Boyd Gaines, always a top ten narrator, gives an excellent performance of this book which is one of the best abrdigements (oximoron) I've seen in a while. Gaines's character accents, including the midwestern accents of all the Wright family, add a great deal to the performance. Wright, Chanute, Langley, Curtis and even Alexander Graham Bell (yes, he had a keen interest in aviation) are all here and their activities are chronicaled alongside the Wrights'. A very well done book very much worth your time. I listened to this because of the 100th anniversary of the Wright Brothers flight last year. It is riveting. If you want to learn about the fascinating history of aviation, this book is a must read!